Back in 1998, Mel Owen was a fresh-faced EastEnders newcomer. 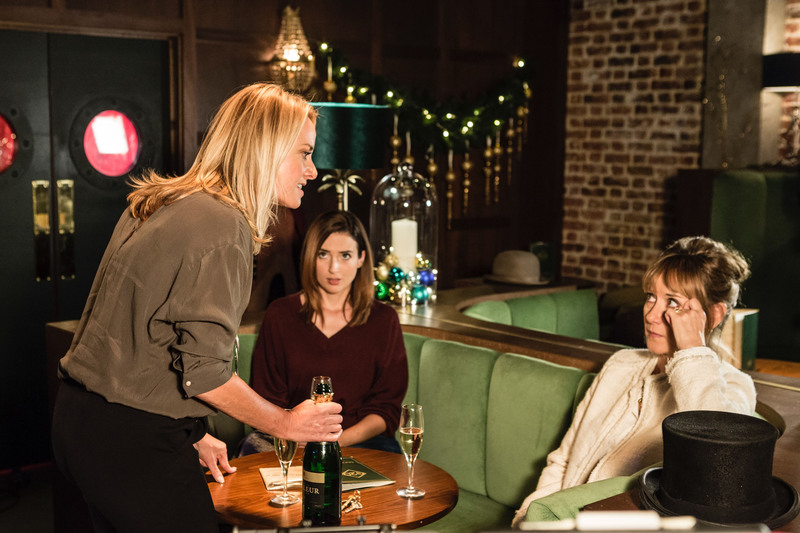 Now 20 years on, Tamzin Outhwaite’s alter ego is set to see out 2018 – and start 2019 – older, wiser and, in this current storyline, infinitely more vengeful. Her romance with old flame Ray was never likely to go smoothly after she discovered the undercover copper was a bigamist with no fewer than two other families. And her New Year’s Day wedding to him is set to be an explosively bitter affair, even by Walford standards. “Mel and the two other wives have planned his demise,” Tamzin, 48, told iN10 after another busy morning’s filming at the famous Elstree Studios. “But the twists and turns of the wedding and the aftermath take us down a completely different route. It was away back in 2002 that Tamzin called time on life in Albert Square. “It seems like a lifetime away because time passes so quickly,” she admits. “I did three-and-a-half years here and then 16 years away. “I came back for the 20th anniversary of the character’s appearance and it feels great. “I am absolutely loving it and I can’t imagine not being here. “Now I feel that I don’t have anything to prove. “Maybe I’m just not particularly ambitious anymore, or maybe my ambitions have all been fulfilled. “I’ve done some lovely series like New Tricks, an awful lot of stage work and played the lead in a West End musical. They were all on a list I wanted to tick off and I’ve done that. While Tamzin reckons she was asked by fans on an almost daily basis whether she’d make a Walford return, that wasn’t the case with show bosses. “This was the first time I was ever asked,” reveals Tamzin. “It wasn’t like I was batting them off. While Ray is obviously an expert at walks down the aisle, Tamzin is no stranger to marital matters herself, when it comes to work at least. “This is the first time I’ve got married as Mel, but I’ve been married many times in other programmes,” smiles Tamzin. Walk Away and I Stumble, co-starring Mark Strong, Final Demand, with Simon Pegg, and Frances Tuesday, with Douglas Henshall, are just a few of the dramas in which Tamzin recalls “I do” moments. This time round, what she’d be wearing was a matter of some debate. “I wasn’t sure if we were going for the full white wedding this time, but when they said we were, I went and found something I absolutely adored. “But they told me it was too much of Tamzin and not enough of Mel. Whatever lies in store for Mel – and frankly it’s not going to be good – screen weddings are something many actors relish. And, full-on, though they are, there can be a useful side product. “When you’ve got a really intense storyline like this, you’re here all day every day,” says Tamzin. “And that feels like harder work. But if you ever want to wear a wedding dress and walk down an aisle in your private life, then it feels like you’ve ticked that box if you do it on screen. “Even though it’s not real, it feels like a little fantasy you can play out. “So, there is a little part of me that quite likes walking down an aisle. That’s understandable as Tamzin’s own marital experience wasn’t a happy-ever-after affair. She wed Tom Ellis, Gary in sitcom Miranda, in 2006 but they were divorced in 2014. However, she has been dating Tom Child for the past year, taking to social media recently to thank him for his love and “making this last year far more beautiful and positive than it ever should have been”. She and Ellis have two daughters, Florence, 10, and Marnie, six, and they are naturally still top of Tamzin’s priority list. “Now I need to film in London because of my children. I really can’t be going away – I live just 35 minutes away from Elstree. “I’m a single parent and they’re at school so you can’t just transport them with you. It’s most important that I’m going home every night. “I’ve got great help, but my biggest extravagance is childcare. My children adore the people that nanny and look after them. Theatre outings with the girls, walks with her Chihuahua, Pip, and hot yoga sessions are also on the Outhwaite relaxation programme for easing EastEnders’ angst when she’s not with boyfriend Tom. Spend some time in her company and it’s clear that being Mel again is something that’s still stretching Tamzin’s acting muscles. “She’s damaged, she’s not perfect and she’s very flawed. She is so deep with so many levels to her. “I love Mel. She’s feisty and she represents a certain type of woman I know. “I feel lucky to call women like that my friend. “She’s probably slightly more serious than most people I know. There were times when she first came in when she was quite larky but now she’s in her dark days again. So how much of Tamzin is in her most famous character? “There’s loads of Mel that’s me. I’m not as stern and I let an awful lot more go. I’m not on a revenge trail like her. And while there are loads of lines to learn – “I do as much as I can at work to avoid taking it home at night” – the buzz she’s getting means Tamzin’s in no hurry to pack her cases and move on again. “Sometimes you do a scene with someone and you feel like you’re playing a game of tennis,” she adds. “You’re bouncing it back and forth and at the end you feel like there has been a little bit of magic. EastEnders, BBC1, Monday, Tuesday, Thursday, Friday.